I have seen several outbreaks of flea beetles on eggplant as I visit community gardens around Georgia this summer. Their damage is easy to identify as leaves become skeletonized due to the feeding of adult flea beetles. If the eggplants are mature, the damage can be tolerated by the plant and you should be able to have a fine eggplant crop. If the infestation is severe or the flea beetles have found young, small plants the beetles can severely damage the plant and cause a reduced yield. Close up of a flea beetle on an eggplant leaf. You will notice the small beetles will jump if they are startled, which is how they came to be called flea beetles. Female beetles will lay eggs around the plant. Emerging larvae will head into the soil and could possible feed on plant roots. The mature beetle will emerge to feed on your plant leaves. The insects overwinter as adults in plant debris and litter in the top of the soil. There will be more than one generation per year. There are chemical controls available and you should contact your local UGA Cooperative Extension office for recommendations. After your eggplants are finished definitely remove all plant debris from the soil bed. I would caution in planting collards or any other leafy green in that same soil this fall. Since you are growing leafy greens for the leaves, you will want to avoid flea beetle damage. Any larvae left in the soil after your remove eggplant debris could emerge to find your greens a tasty meal. Now that you have chosen your tomato plants it is time to put them in the ground. 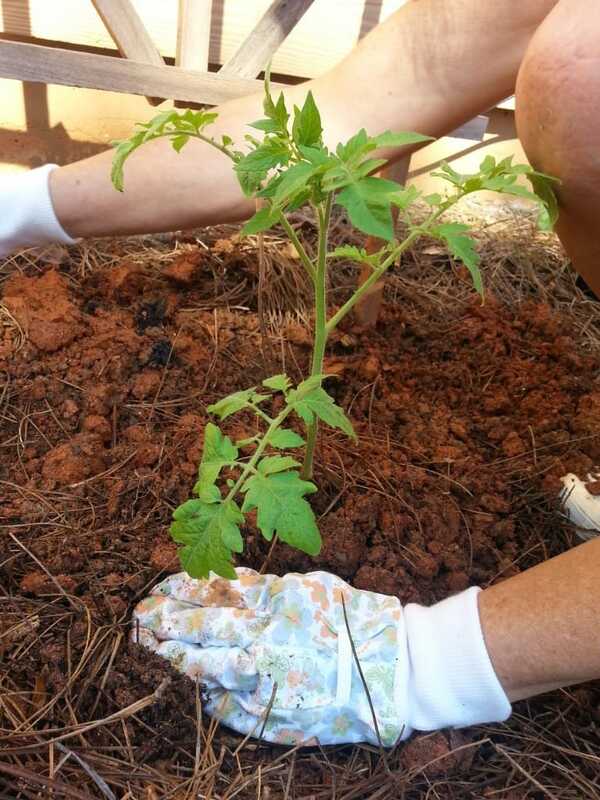 There is a trick to planting tomatoes that helps them get through a long, dry, hot Georgia summer. Step 1: Tomatoes need full sun, 8 hours, for setting fruit. They also need well-drained, porous soil with a pH of about 6.2. Plan on giving them at least 2 feet X 3 feet of growing space. You will need to stake the plants or use wire cages to contain the plant growth. Once you have your site ready, start with a healthy plant with a strong stem. Notice the stem seems hairy. 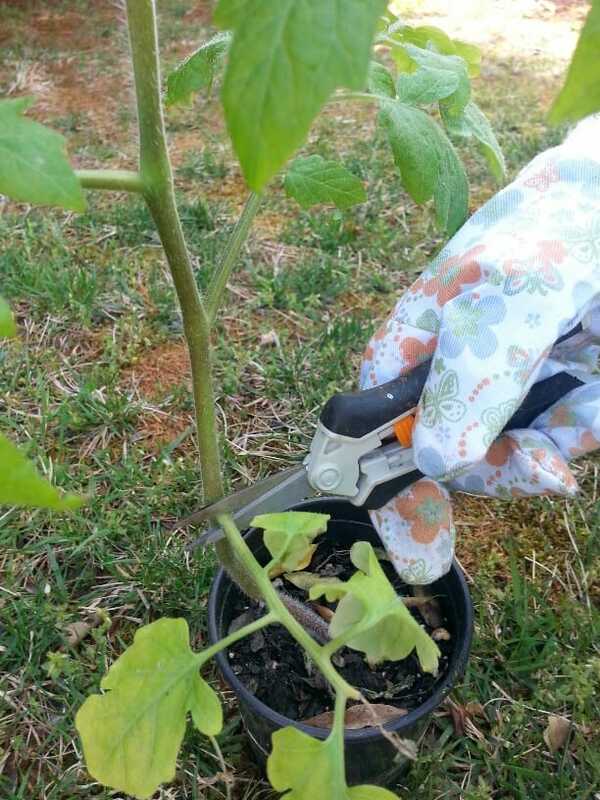 Step 2: Gently remove the lower leaves with snippers or by pinching them off with your fingers. Be careful not to make tears along the stem which would create wounds. Leave the top two or three leaves. The hairs on the now buried stem will become roots creating a strong root system to better handle periods of drought. Step 3: Dig the hole deep enough so that you can bury the stem up to the remaining top leaves. The part that is planted under the soil will develop roots creating a strong, deep root system that will help the plant better handle dry periods. Press the soil around the plant so that a slight depression is formed for holding water. These steps should get you one step closer to that BLT! For more information about growing tomatoes see Robert Westerfield’s publication Georgia Home Grown Tomatoes. For the best information for your area, contact your local UGA Extension Agent. Over the next weeks we will be exploring the world of tomatoes. They are the most popular plant in community gardens. But tomatoes can be problematic. Together we will share the good, the bad, and the delicious of tomato growing. Please share your experiences. To begin our tomato journey we are going to look at some tomato terminology. When deciding on what type of tomato plants you want to grow, choose if you want determinate or indeterminate varieties. Determinate plants bear all of their fruit at one time. The plants tend to be more compact and easier to manage. 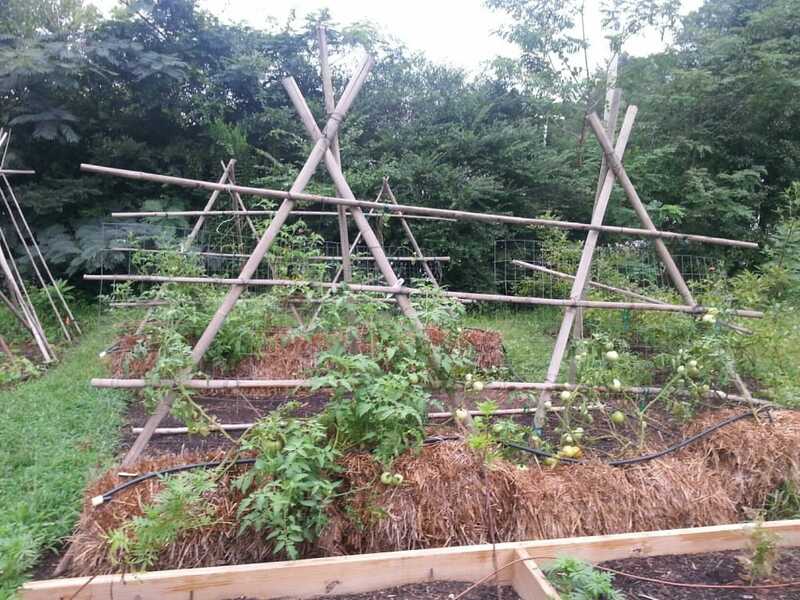 You will probably still need to support them with a tomato cage or staking. Determinate varieties are popular with growers who want to preserve the fruit, make tomato sauces, or salsas as they get all the fruit at once. Indeterminate varieties bear their fruit throughout the growing season. The plants tend to sprawl and will definitely need support by staking or caging. Growers who like to eat fresh tomatoes throughout the summer prefer indeterminate varieties. V – Resistance to the fungus that causes Verticillium wilt. F, FF, or FFF – Resistance to the fungus that causes Fusarium wilt. Sadly, some of the fungi developed immunities to the resistance qualities of the initial “F” tomatoes, so breeders developed cultivars that are resistant to the newer fungal races so now you may see “FF” and “FFF”. St – Resistance to the fungus that causes Grey Leaf Spot, Stemphylium solani. Big Boy VFN shows resistance to Verticillium wilt, Fusarium wilt, and nematodes. Tomato plant sellers in your area should stock the tomatoes with the resistance you need. Look for the resistant cultivars in seed catalogs as well. Don’t rely on planting disease resistance cultivars as your only line of defense against disease. Good cultural practices like proper irrigation, mulching, soil building, fertilization and removal of diseased plants are examples of the integrated pest management (IPM) you should be using. If you think your tomatoes have one of these diseases contact your local UGA Extension office for confirmation. Georgia Home Grown Tomatoes is an excellent publication for tomato connoisseurs. With the recent warm temperatures it is easy to be seduced into planting your summer crops now. It is tempting to plant our vegetable transplants and seeds; we can’t wait for that first juicy tomato are a crunch pepper! Be aware that soil temperatures are very important for success with your early summer plantings. Soil temperatures need to be 60-65 degrees F and rising at the 4 inch soil depth before you plant your summer crops. If you install a transplant too early the roots won’t grow and the plant will just be sitting in the soil. If we have a large amount of rain, which seems to be the norm this year, your new plant will just be sitting in wet soil. This could mean early disease issues. This morning the Blairsville weather station, near my home, indicated a 4-inch soil temperature of 44.1 degrees F. Dallas reported a 4-inch temperature of 47.2. In Griffin the 4-inch soil temperature was 50.9 degrees F while Tifton reported 56.3 degrees F. It is too early to think about tomatoes and peppers! If the soil temperatures are not warm enough for seed germination, early seed plantings could rot. The roots need to be actively growing to absorb water and nutrients. 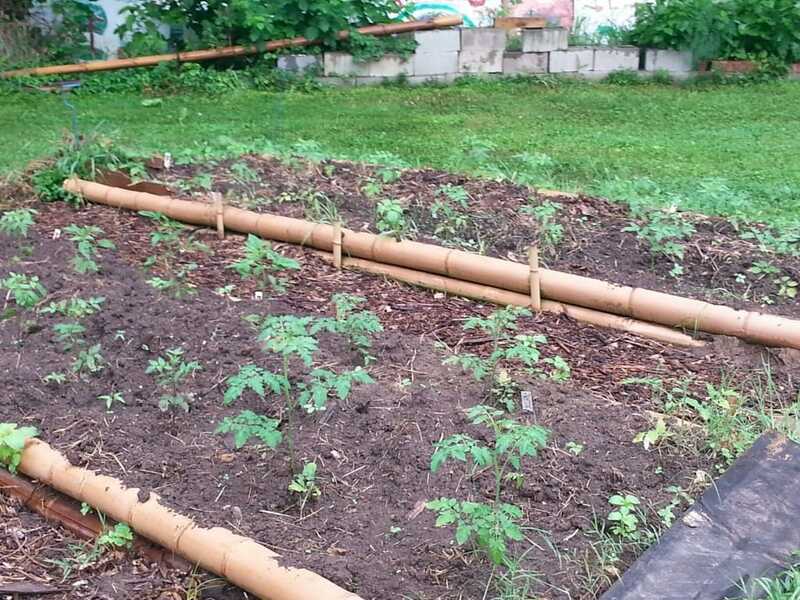 If we plant and fertilizer summer vegetables too early we will be wasting fertilizer. The plant roots simply can’t absorb it. This fertilizer could get washed away, wasting your time and money. Also, this leached fertilizer could be problematic for our watersheds. To determine your soil temperature at the 4 inch depth visit www.georgiaweather.net. Click on the station nearest your garden. Or, you can see a summary of soil temperatures across the state. Tomatoes planted last year AFTER the soil temperatures warmed up. Waiting until the soil temperatures are warm enough is one step to success for your summer garden. Remember the rule of thumb is play it safe and wait!